Disclaimer: I am currently between jobs, the opinions expressed here are entirely my own and do not necessarily reflect the opinions of any past or future employers. With the advent of deep learning, AI winter is officially over. Neural networks are back with a vengeance. Once again imaginations are running wild with post-apocalyptic scenarios in which an evil artificially intelligent being takes over the world. I am fairly confident that true human-like AI, once we do eventually develop it, will be much more like the Bicentennial Man than Skynet. I am eagerly awaiting the moment. This makes me wonder how much time we actually have left before it happens and what pieces are still missing. The exciting thing is that a lot of the pieces which just a few years ago I thought were still missing, are largely in place now. The way I see it, only two pieces out of eight still remain before a big breakthrough happens, so in a way we are 75% there. Below is a list of these pieces. All of them have been researched to some extent, but I consider the first six largely a done deal. It is the last two which mostly separate us from the end goal. ✔ Scale of data and computation. This is a pretty trivial one: computer systems today rarely match the scale of a single human brain, but the sizes are growing rapidly, so it is only a matter of time until we reach a critical mass of raw computational power. What is perhaps less trivial, is the amount of data which needs to be fed to such large systems in order to make them useful, but thanks to our growing reliance on computers and the steady transition of our lives into the virtual world, the amount of available data is also growing exponentially. ✔ Unsupervised learning. This is related to the above. Supervised learning simply doesn't scale, so the only way to learn from the vast amount of data available today is to let an algorithm sort it out on its own. Starting from Google's seminal work, recent results have shown that unsupervised algorithms can tackle problems which up until recently were only achievable using supervised learning. ✔ Neural networks. I was always fascinated by neural networks and never gave up on them (even though I was sometimes embarrassed to admit this once they fell out of grace). 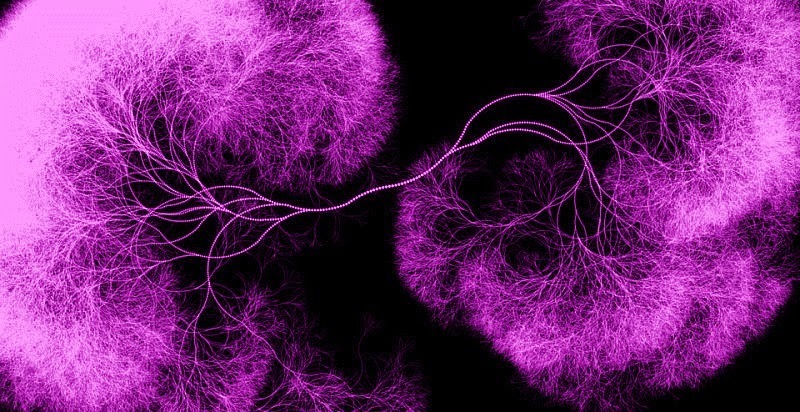 Deep learning algorithms have breathed new life into the approach and neural networks are again in the forefront of machine learning research. More than the algorithms themselves, what I think is important is the amount of research going into computing systems designed to mimic the human brain, since there is still so much we can learn from it. ✔ Hierarchical modularity. All complex systems follow a hierarchically modular design in which simpler components are combined to produce ever more complex ones. Up until recently, most machine learning models did not have this property. This changed with the advent of deep learning networks in which each subsequent layer builds on the previous one to learn ever more complex features. Even though this strictly layered structure is not very natural (more on this in point 8), the general idea of modularity is a crucial one. ✔ Information-theoretic approaches to modeling understanding. This recent article shows that there is still a lot of controversy around what it means to understand something and how to model understanding computationally. But modeling understanding may turn out simpler than it seems. It may boil down to what are essentially compression algorithms. Two approaches which emerged recently seem to point in this direction. One is sparse coding. Sparse coding is a technique used in deep neural networks. The essence of the idea behind it is to represent the observed data with the smallest generative model possible. As part of a deep neural network, these models learn to represent ("understand"?) complex visual features, such as human (or cat) faces. A related approach involves building models which can take incomplete or noisy data and reconstruct the missing parts of it. My favorite example is word2vec which trains a model to guess words in a sentence given the surrounding words. The fascinating thing about it is that the resulting model — vector representations of words — reflects many properties of the words' actual meanings. For example, variations of a word and its synonyms end up close in the vector space. Linear arithmetic on the vectors reflects analogies, such as "Rome is to Italy as Paris is to France", or "man is to king as woman is to queen". In a way, the model learns to "understand" the words. Whether these simple information-theoretic approaches are really the key to what we perceive as understanding may forever remain a philosophical question. But the results speak for themselves and so far the results of applying these approaches to computer vision and natural language processing tasks are enough to convince me that they are the key ingredient and that there is not much more to what we perceive as understanding. ✔ Transfer learning. Transfer learning is applying the knowledge gained from learning one domain to a different domain. It is clear that intelligent life forms do this, but most machine learning algorithms used today are trained and evaluated on one very specific problem in one domain only. I am going to give this one a check mark anyway, a little bit ahead of time. First, because it is an active area of research and discussion. Second, because the approaches described in the previous point are a precursor to full-blown transfer learning. For example, word representations learned by training a model to guess surrounding words in a sentence can then be used for a wide variety of natural language processing tasks, such as part-of-speech tagging, named entity recognition, sentiment analysis, etc. While still not cross-domain (all these are NLP problems), we are seeing models trained to solve one problem contribute to solving other very different problems within the same domain. ✘ Evolutionary algorithms. The majority of algorithms used to train machine learning models today all follow the same basic principle. This is true for both simple models, such as logistic regression, or backpropagation neural networks, and the newer deep learning approaches. The principle is to use gradient descent or related optimization algorithm to optimize a well-defined function. This function can be the error in the case of supervised learning, or a measure of how well the model represents observed data in the case of the newer unsupervised deep learning approaches. But nature does not do gradient descent. Even though the theory of evolution often cites a fitness function, no such function can be formally defined. Organisms exist and interact with each other in an ever-changing environment and what it means to be "fit" is different in every instant of time and every point in space. Rather than optimizing a specific function, the optimization algorithm used by nature is the very simple, yet profoundly powerful duet of variation and selection, which does not require the definition, or existence, of an explicit fitness function. Evolutionary algorithms which do not optimize for a well-defined function, but are based purely on variation and selection, have existed for a long time. They are not, however, widely used in training machine learning models today, because they are much less efficient than the algorithms which optimize a well-defined function. This is one thing which I believe will change in the next years and will open the path to true AI. The advantage of gradient-descent-like algorithms, the ability to quickly converge in a defined direction, will also be their undoing, since they are not able to optimize for the unknown, or for what may not even exist. Real intelligence is a constantly moving target and cannot be modeled by a simple function. My prediction is that in the next years evolutionary algorithms will experience a revival similar to the one neural networks experienced recently. We will start using purely evolutionary algorithms for training models. This will require more computational power, but will ultimately produce much more complex and powerful systems. ✘ Learning network topologies. The neural network models being trained today have a fixed topology. Training consists of updating the connection weights. Whereas it has been postulated that training the structure itself could be beneficial, there is no good way of doing it using the current learning algorithms. This will change after the previous piece falls into place and we move to evolutionary training algorithms. When that happens, the network topologies will evolve as well. Perhaps at this point the topology will even fully define the model and there will be no need for additional weights. I am pretty sure that those evolved topologies will not have that neat man-made layered architecture modern-day neural network models have today. Rather, my bet is that they will resemble other graphs which occur naturally in nature, such as the actual connections in the brain, social networks and airline routes: small-world networks. These topologies evolved naturally and are an effective way of creating highly connected scalable systems in which information flows efficiently. (Bonus) Redundancy and robustness. Human beings can lose large chunks of their brain sometimes with surprisingly little impairment. Conversely, deep learning networks get thrown off by a couple of distorted pixels. Clearly, real life intelligent systems have a lot of redundancy and robustness built in and true AI will necessarily have it as well. I am not including it in the count, though, because I think that it will be an emergent property of the system, which will just arise naturally once all of the other pieces fall into place. The past few years have witnessed a continued explosive growth in data sizes and the availability of computational resources. This was coupled with advances in algorithms, such as deep learning, which make use of it and exhibit increasingly intelligent behavior. These behaviors, such as the ability to learn meaningful visual features, or word representations, are increasingly resembling elements of human intelligence. Yet, we have not been able to create anything which fully resembles true AI, so clearly there is still something missing. I postulate that this missing piece is moving away from optimizing well-defined functions and towards purely evolutionary trial-and-error algorithms. Furthermore, these algorithms should be applied to train model topologies and that these topologies will end up resembling small-world networks. Such approaches will need a lot of computational power and data to train, but those will be available in the near future. Of course, there is no way of really predicting when and how the singularity will happen... but I do have the feeling that we are getting awfully close. What do you think? You apply for a position at a company and interview with five individuals, each of which then casts a hire / no-hire vote. You don't get the job and decide to file a discrimination lawsuit against the company. You don't specify which of the five interviewers was being discriminatory or if you were being discriminated against based on gender, race, religion, age, or sexual orientation. The judge forces the company to disclose historical hire/no-hire decisions for each of the five interviewers and declares that if you can show that one of the interviewers is significantly prejudiced (at p = 0.05) with respect to one of the five characteristics, then they will rule in your favor. Assuming that none of the interviewers are actually biased, what is your chance of winning the case? The answer is: approximately 72%. Yep, you are almost three times as likely to win the case than to lose it, even when no actual discrimination is taking place. This apparent paradox is a typical example of data dredging and it is what people mean when they warn against the perils of big data, or even downfall of science. The problem is not intrinsic to big data or science, but stems from what most problems tend to stem from: people doing things without fully understanding what they are doing. So I thought I would take this chance to explain some of the key concepts behind statistical significance and data dredging using the discrimination lawsuit paradox as an illustration. The question is: is X discriminating based on gender, or in other words, does X have a bias towards men or women? We can see that he (or she?) voted hire for 3 out of 11 men (27%) and 5 out of 9 women (56%) — more than double the rate. So it looks like he may have some bias against men. But does this really mean that he is discriminating, or did he just happen to come across some really qualified female candidates and some really unqualified male ones? "Let's give X the benefit of the doubt and assume that he is not discriminating (the 'null hypothesis'). What are the odds that he would be so unlucky with his male candidates to end up with this amount (or more) of skew towards women?" The p-value is simply the sum of the probabilities in the row in question (in this case 16.504%) and all the rows which are even more "extreme" (in this case, even more biased against men). So in this case the p-value is around 20%, or 0.2, which is usually not considered "statistically significant". The lower the p-value, the more statistically significant the result. Typical p-value thresholds for achieving statistical significance include 0.1, 0.05, or 0.01. So if there had been only two men among the eight that X voted hire for, the bias would have been considered significant having a p-value of around 0.04. But since he (or she) voted hire for three men, the bias should not be considered statically significant. This misconception keeps getting repeated leading to a lot of confusion, but the truth is that you just can't compute the actual probability that X is biased, unless you have access to all the different parallel universes in some of which X is biased and others isn't. Note: In real life we would also have to account for the overall rate of hire vs. no-hire decisions for the two genders, which may not actually be equal for reasons unrelated to discrimination. For example, girls may tend to chose different colleges than boys and some colleges may be better than others at preparing candidates for whatever is the job in question. But this would make the math more complicated, so for the purpose of this example, let's assume that the overall rates are the same for men and women in the general population. Coming back to the original interview question: we have five different interviewers and each of the five interviewers can be prejudiced with respect to five different possible factors (gender, race, religion, age and sexual orientation). This makes 25 possible combinations of interviewer and prejudice. For each of these 25 combinations we can compute the p-value just like we did in the previous section. Assuming that none of the interviewers is actually biased, the probability of any one of these results showing statistically significant bias with a p-value threshold of 0.05 is 0.05 — that's just the sheer definition of p-value. But this means that the probability of at least one of the 25 showing statistically significant bias is 1 - (1-0.05)25 ≈ 0.72. In general, the more hypotheses you are testing in hope of uncovering a "statistically significant" one, the more likely that at least one of them will show significance due to pure chance even if no underlying pattern exists (a false positive). 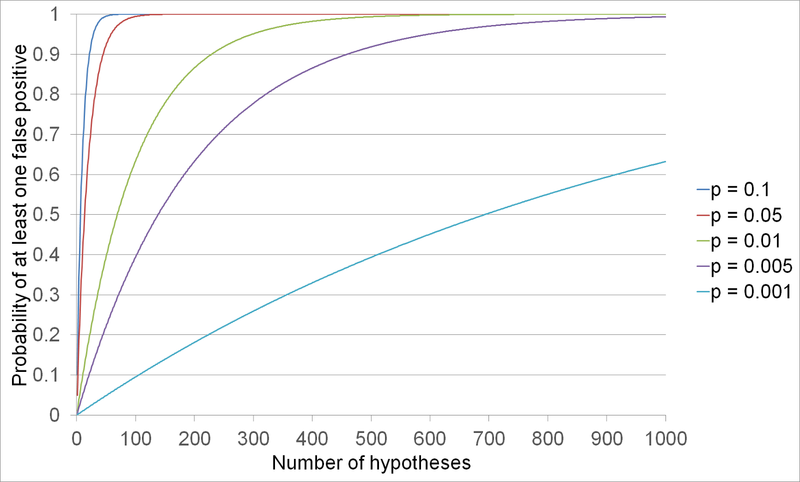 This chance gets lower if you lower the p-value threshold, but no matter how low the p-value threshold is, given enough possible hypotheses, the probability of at least one false positive quickly approaches 1 (see graph below). This shows that you should always take every statistically significant result with a grain of salt and ask yourself: how many hypotheses were tested before this seemingly significant result was found? You can see many examples of this in medicine (testing numerous drugs to see what works, or testing multiple combinations of genes and conditions to find a correlation), as well as software development (A/B testing multiple features and adopting only the ones which show "significant" improvement). There is nothing wrong with computing p-values, but taking action without knowing what they mean exactly can quite literally have perilous results. This video posted by Numberphile has been making the rounds lately, supposedly proving that the sum of all natural numbers all the way to infinity is equal to negative one twelfth. The guy in the video, Tony, uses pretty basic math to derive this formula and at first glance it may not be immediately clear what is wrong with his derivation. To add to the mystery, he flashes a page from a String Theory book which quotes the formula, albeit in a very different context. Despite a lot of controversy this video seems to be generating lately, I don't see a good explanation of what exactly is wrong with this proof among the top Google results, so I'm going to try to make it clear here. The derivation uses "..." to denote something different in the case of computing S1 and something else in the case of S2, hence the entire derivation is invalid. There is no interpretation of "..." which, if used consistently alongside sums of natural numbers, would lead to S = 1 + 2 + 3 + ... = -1/12. Now, mathematical models may exist which use similar notation to the one used for integers and sums, but model phenomena other than natural numbers. Such models may abide by different rules and you may get results which don't carry over to the natural number world. This is probably what the String Theory book is doing (you can check it out at Google Books here). But these mathematical models would still have to be internally consistent in order to be useful, unlike the Numberphile framework which could be used to derive contradictory results, hence has no application other than entertainment. The argument behind this is that if the sum were cut short at any given point: if this point were odd, the sum would be 1 and if it were even, the sum would be 0. Tony goes on to say: "Do we stop at an odd or even point? We don't know, so we take the average of the two." Note that this whole argument relies on the assumption that we do stop the series at some point. We just don't know if this point is odd or even, but not stopping at all is not an option. This is an essential distinction. The traditional mathematical definition of infinite sums, assumes that you never stop. Since you never stop, you never stop at a point which is odd or even, hence the sum is undefined (we'd call this a divergent series). There would be nothing wrong with using the infinite sum notation to denote the expected value of a finite sum. In fact, the above definition is called the Cesàro sum and is a well-known mathematical concept. The problem is that having chosen the Cesàro sum as the interpretation of "...", Tony would have to stick to this definition for the remainder of the proof. But he does not do that. In fact, for the rest of the proof, he uses the same notation to mean the actual infinite sum, which never stops. This is a perfectly valid operation when you are dealing with actual infinite series, because those go on forever. So even if you shift them, they can still align perfectly all the way to infinity. But it does not work under the expected value definition, since the expected value definition assumes that the series stops at some point, in which case the shifted version of S2 would have an extra term at the end which would not align with the un-shifted version. Today is all about being data-driven. And the first thing you need for being data-driven is metrics (or so called Key Performance Indicators – KPIs, if you like acronyms). So we all scramble to establish our metrics quickly, so that we can start being data-driven as soon as possible. And thus we often fall into a trap, because bad metrics can cause much more harm than being data-driven can cause good in the first place. There are plenty of excellent examples of bad metrics and their destructive power in the literature, but I would like to call out some examples from the area which is closest to my heart: software engineering. The e-mails had an immediate effect: everything just stopped working. Why? Well, we all felt pressured – probably more in front of each other than in front of anybody else. Everybody wanted to be high on that list for the sheer pleasure of being on top of a list. So we all automatically switched our behavior to optimize for the metrics we were presented with. But everybody has limited resources and everything is a tradeoff, so optimizing one thing means sacrificing another. So we focused on fixing bugs as fast as we could. And since there were many bugs to choose from, we fixed the ones which allowed us to fix more in the finite time we had, such as “First letter in address label should be capitalized.” We skipped over the bugs which were really hard to fix, but of course those were the ones which were the most important. At another company we measured code coverage to get developers to write unit tests. Perhaps this did motivate some developers who weren't writing unit tests at all before to start writing some unit tests. But what was much worse was that developers who were writing useful unit tests before, switched to writing completely useless ones. They were useless, because they focused on code coverage and code coverage is not an indication of unit test effectiveness. Even though this particular example is made up, the general idea is exactly what happened: I literally saw hundreds of unit tests without a single assertion statement in them. But guess what, 100% coverage. Needless to say, these unit tests would not catch any of the common mistakes listed above. So don’t mess with them unless you know what you are doing. It can cause more harm than good. Trying to influence something which seems correlated to the goal, but is not the goal itself, rarely works. It is true that code coverage is correlated with having good unit tests, but that’s because good unit tests create code coverage and not the other way around. Thinking that you can improve your unit tests by increasing code coverage, is like thinking that you can reduce crime by reducing the number policemen, since cities with few policemen have fewer crimes. Good developers, when faced with a lack of clear guidelines, tend to gravitate towards doing what makes sense. So leaving them be may be better than imposing bad metrics or incentives. Also, gathering their feedback and accounting for extra time for quality improvements can be a good idea. The only good metrics are those that actually matter to the business. So if your customers don’t pay you for the number of bugs you fix in your code, the lines of code that are covered by unit tests, or the total lines of code your team produces, then that’s not what you want to measure. The great article The Rise of Developeronomics argues that the biggest success factor for any company nowadays, software or other, is its ability to attract and retain high-end software development talent, and that it's only going to get more so from here on out. Companies seem to get this - at least judging from the number of unsolicited recruiter mail I keep getting, but often fail miserably in retaining their engineering talent. Why is that? The reason, it would appear, is that companies fail to see what engineers really want. They assume that their only bargaining power is cash (or other financial instruments, such as stocks or options) and perhaps benefits (but those can be translated into cash in one way or another as well). So they compete with each other on price, which has the only effect of engineering salaries going up industry-wide (not that I complain :)). But as a chunk of the commodity you are so fiercely competing for, let me share a piece of insight: salary is not what makes the big difference. Sure, money is nice and if you don't pay developers a decent amount of money, they will find somebody who does. But salary concerns are not what usually makes developers leave their job. And yet developers leave all the time. The turnover rate in the profession is through the roof to the point that even my dentist commented on it the other day! That's costing the industry who knows how many billions in turnover costs and lost productivity. And since that's deadweight loss (yes, I just learned a new term from my economics book), it is making all of us so much poorer! 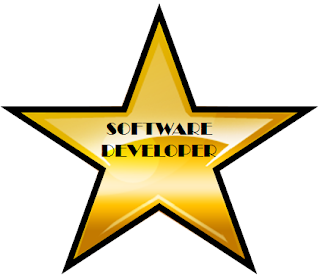 The thing about software developers, at least all the good ones, is that we work because we like to. Most of us would do it even if we didn't get paid for it. The reason we like it so much is the thrill of creating something. It's the empowering feeling of making something of value, practically out of nothing. It's really exhilarating. So imagine how we feel if we spend all our effort creating something in expectation of this thrill, only to find our work thrown out the window. It's as if a sculptor worked for years on a statue only to have the sponsor of his work demolish it before it was finished. Strange as it may sound, this happens all the time in software companies, big and small. Projects get thrown out, priorities change. I even heard of larger companies deliberately assigning the same project to multiple teams with the intent of keeping one and closing others down. These decisions are made by managers which push around project risk and budget estimates, but are those managers factoring in the cost to their human capital every closed down project is incurring? Companies often see acknowledging success as a way of directing employees to do certain things and not others. So when they see an engineering team produce good results, they don't fell like they need to acknowledge any individual team member's good work. But acknowledging success is important not just as a directing tool, but as confirmation that what we are doing is being appreciated. Yes, engineers are often needy. And vain. And insecure. We really like to be praised and told that we did well, regardless of whether the praise comes in the form of a cash bonus or just a plain old pat on the back. But beware not to hand out praise arbitrarily, without any connection to merit, or else the developers will quickly catch on and it will lose its value. We all know who on the team did well and when. We just want to know that you know it too. It's a no-brainer that any employee is happier when working on what they like and having the chance on working on what you like makes you want to stay at the job and not leave. But some managers seem to think that if they don't make decisions on how to hand tasks out to people, then they are not justifying their salaries. Of course, the job of a manager or a lead is to ensure that what needs to get done, gets done. But this still leaves a whole lot of room for optimizing task assignments according to individual preferences. Unionized airlines have built very complex systems around ensuring that crew members get to fly to their individually preferable destinations, so that they can please the union which holds all the cards. If The Rise of Developeronomics is any indication, developers are the ones with the cards in a modern company, so optimizing for their work preferences is a powerful tool for winning them over. And it can even save on some managerial overhead. Like every motivated individual, developers strive to get better at what they do. Part of this is learning new skills and improving existing ones and part of it is establishing oneself in the broader community, since in many ways the community as a whole can achieve much more than the sum of its parts. So allowing and even encouraging such activities can help keep employees happy in addition to growing their value. Companies should take this into account when making a decision not to send employees to a conference, because it would take time away from project work, or preventing an employee from blogging, in fear that it will expose sensitive information. Not to say that decisions like these are never justified, but too much repression can lead to employees feeling like they can't spread their wings and they will leave (especially the ones with wings, which are the ones you want to hold on to the most). Very good developers are unable to write bad code, but even the best of us try harder when we know that our name is going to be on what we are working on... even more so if that means that we will have to maintain it later :) At the same time, we hate having to pay for other people's laziness, by having to maintain thier bad code. That's not to say that only one person should be looking at any given area of a project. On the contrary, code and design needs to be constantly reviewed by multiple people to ensure quality as well as skills and knowledge transfer. But maintaining clear and constant areas of ownership throughout the process leads to better work quality as well as much less frustration and happier engineers. The Rise of Developeronomics talks about the cost of bad developers incurred when their bad code blows up. But there is another cost of bad developers and that is their bad effect on the good developers. I, for one, suffer when I see bad code. When I see some really bad code, I feel nauseous and need five minutes of browsing Facebook before I can bring myself to look at the IDE again. That's lost productivity right there. And then there's the fact that knowing that other pieces of the product are going to be written badly anyway, doesn't make me want to try as hard to make my pieces perfect. Finally, all the stress caused by having to debug and integrate with badly written components is a motivator to look for a different company with a better team. So it is important for companies to acknowledge code quality in their process, as well as the individual developers' commitment to it. Note that this is not about junior employees and senior employees, because I don't see all that much correlation between code quality and seniority. It's the right mindset that matters and junior developers with the right mindset will intuitively write high quality code from the start, while sloppy developers will not only poison your code base, but drive all of the good developers away. We've all heard this story. All was fine until one day your boss heard somewhere that Hadoop and No-SQL are the new black and mandated that the whole company switch over whatever it was doing to the Hadoop et al. technology stack, because that's the only way to get your solution to scale to web proportions while maintaining reliability and efficiency. So you threw away your old relational database back end and maybe all or part of your middle tier code, bought a couple of books, and after a few days of swearing got your first MapReduce jobs running. But as you finished re-implementing your entire solution, you found that not only is the system way less efficient than the old one, but it's not even scalable or reliable and your meetings are starting more and more to resemble the Hadoop Downfall parody. The problem with Hadoop is that it is relatively easy to get started using it without an in-depth knowledge of what gives it its powers and without this, you are more likely than not to design your solution in a way which takes all of those powers away. So let's take a look at the few key features of Hadoop and what not to do to keep them. It brings the computation to the data. So instead of sending large amounts of data over the network to the machines which execute the computations, it tries to run the computations directly on the nodes which contain the required inputs. It processes files sequentially, reducing the number of costly disk seeks. Unless the Hadoop cluster is running on SSD hard drives, it will take it order of 10ms to seek to a new place on the disk. On the other hand during the same amount of time, it can read an order of 10 megabits of data from the disk sequentially. So you can't process large amounts of data if the process involves frequent seeks. It uses compression, memory buffers and other optimizations to make the data flow in the system very efficient. Do not: Physically separate your data cluster from your compute cluster. Whether your data is coming from HDFS, HBase, Cassandra or somewhere else, if it is not stored on the same machines as the MapReduce jobs are running on, it is impossible for Hadoop to bring the computation to the data. Cases exist when such a solution is acceptable, in particular when the jobs are more compute intensive than data-intensive (they do a lot of computing and not a whole lot of reading and writing data) and Hadoop can still be a good option for such jobs, but it's full potential is with jobs which process large datasets with relatively simple computations. Do not: Create location inaware input formats. Often the input formats which come with the data storage you are using do not exactly fit your system and you have to write your own. Make sure that as you do that, you implement location-awareness by implementing a non-empty InputSplit.getLocation() or by inheriting this functionality from a superclass if you are extending an existing input format. Do not: Read or write external data in the map or reduce tasks (apart from reading the input and writing output as orchestrated by the framework). For example, you may be tempted to make database read or write calls directly in the map or reduce code and there's nothing to prevent you from doing it. But especially if you are doing a lot of small random lookups, you are losing all of the optimization the framework provides for the efficient streaming of data through the system. Also, if you are accessing a limited availability resource, such as a SQL database, you may be introducing a bottleneck which prevents the solution from scaling (see Scalability). Do not: Write code to copy files around manually. Once again, the Hadoop framework does a lot to optimize the flow of data during a compute job, but copying files around manually will always incur heavy network traffic (as data is replicated) and cannot be optimized since the system does not know what it is you are trying to do. Apart from the input/output mechanism, Hadoop also offers a distributed cache which can be used to bring data to your tasks. Those provided mechanisms are usually the most efficient way of bringing data and computation together. Hadoop is highly scalable in the sense that you can grow your cluster to many thousands of nodes and the computing throughput increases linearly with it. That's because Hadoop doesn't have bottlenecks. But that doesn't mean that a system implemented on top of Hadoop automatically doesn't have bottlenecks either. Do not: Synchronize tasks. Since tasks are executing in parallel, it may be tempting to add synchronization between them and with tools such as ZooKeeper it is fairly easy to add all sorts of distributed synchronization mechanisms such as locks or queues. But every synchronization is a bottleneck, so workflows using those almost never scale. Do not: Use a constant number of mapper or reducer tasks. The number of map tasks a job is split into is proportional to the size of the input, so the scaling of the number of mappers comes naturally as the size of the input grows (as long as you remember about this if implementing a custom input format). But the number of reducers is defined by the programmer. Since the number of reducers also defines the partitioning of the output, it may be tempting to keep it constant or maybe even always keep just one reducer, so that the output is just a single file. But if you do this, you are preventing the system from scaling out as the amount of data and the cluster grows. Do not: Talk to the job tracker. It may be tempting to have tasks talk directly to the job tracker which scheduled the job to find out extra information about the job or the other tasks. For example, you may be tempted to have the reducer ask the job tracker for the total number input records, in order to turn the classic word count example into an IDF calculation. But the job tracker is a single resource, so such practices could prevent your job from scaling and could also give misleading results, since the job tracker may not always be serving up the latest statistics as the job is still running. The Hadoop MapReduce framework handles failures gracefully. If a node in the cluster fails mid-task, it will just re-run the task on a different node. It also hedges against having to wait for slower nodes by starting tasks on multiple machines to begin with (what is referred to as "speculative execution"). But if you are not aware of these mechanisms, your system may end up not functioning as expected. Do not: Write an output format without considering output committer functionality. If using FileSystemOutputFormat or its derivatives, only the output of the successful tasks makes it to the output directory of the job and the rest are discarded. This logic is handled in by the FileOutputCommitter. Some custom formats may not need committers, for example if they are writing to a key-value store which automatically keeps only one value per key, but in other cases, failed and subsequently restarted jobs, or tasks scheduled speculatively, could result in output data inconsistencies, such as duplicate records. Do not: Write tasks with side effects. If a task has side effects, for example if it writes to an external data store directly, then retried tasks or tasks scheduled concurrently through speculative execution, may end up not functioning as desired.